The site of the proposed Boathouse in Cork which lies east of the City Centre and extends eastward from Brian Boru Street to Lower Castleview Terrace on the Lower Glanmire Road. Lower Glanmire Road represents the eastern gateway into the City for both the road and rail networks. 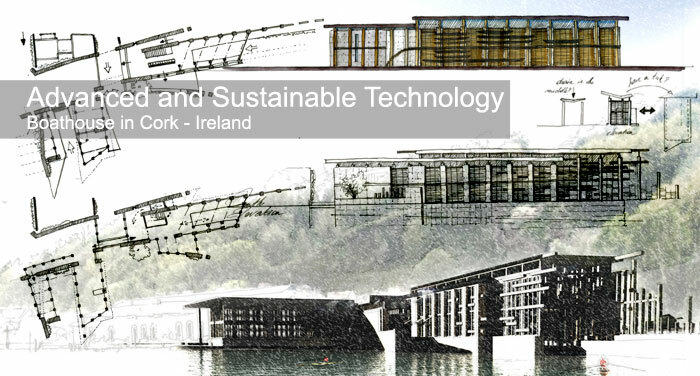 The task in this assignment is to design a new Rowing Club 'Boathouse' Situated on River Lee in Cork. This project comprises the major assignment for the Advanced and Sustainable Technology module, the purpose of which is to enable us to demonstrate the application of advanced building construction technologies and the integration of sustainable design and technology in an holistic architectural design. High level of detail and aspects of construction technology is expected to be explored within this project. 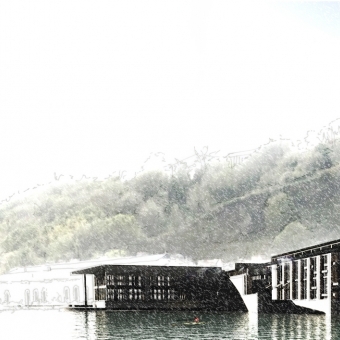 Because of the setting of the site, it needing to be a landmark of architectural significance, and the typology of the project, the challenge of this project lies with portraying the use of the building in such a way it lures people into the city, into the building as well as promotes good health simultaneously. Careful consideration must be carried out towards selecting the appropriate approaches with regards to sustainable technology to reflect the use of the building, the character and feel of the immediate environment.